Alright, so you’ve gotten yourself a beautiful new LG CINEMA 3D Smart TV. You’re just minutes away from enjoying great 3D content. We understand your excitement. But before you dive right in and start powering things up, take a moment and know your ports. It’ll make your set-up easier and you’ll probably pick up a few tidbits on how to make the most of your TV. We say “probably” because our engineers have packed plenty of ideas in these units. Let’s take a look at the ports. That’s a lot of ports! Your CINEMA 3D Smart TV may not have an identical layout, but it will most likely have a similar configuration. Now let’s get into what some of these ports can do for you. A good example is the HDMI Port and also a great place to start. Who besides gamers even knew what an HDMI was a few years ago? Well, thankfully today there are so many digital peripherals around us that can make use of HDMI ports. Besides your game console, think: digital SLRs, computers, notebooks, game consoles, camcorders, and even tablets. As the name suggests, it’s a FULL HD connection and the real beauty of it (besides those great HD videos) is that it also takes care of the sound. Ok, we don’t all have HDMI ports on our PCs. But that’s not a problem. Whatever computer you do have, it will have what’s called an RGB connection. It’s been the standard for video/monitors for about 2 decades. So if you don’t have an HDMI port but still want to connect your PC, just unplug your monitor and plug that same cable into the TV. Click on the inputs and select “PC” and you’re good-to-go. Just keep in mind that you’ll need a separate audio connection for your sound. USB ports have become pretty common on our computers these days and you’ll find a bunch on your LG CINEMA 3D Smart TV as well. 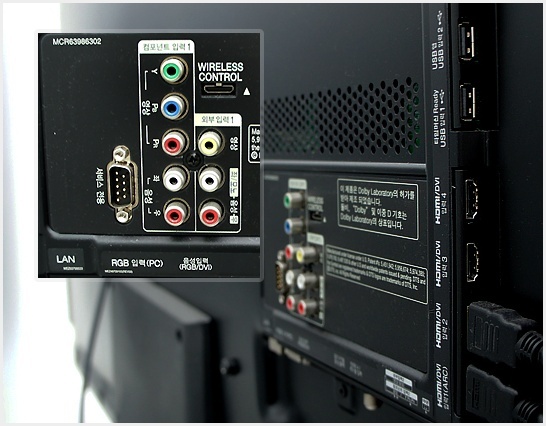 What many people aren’t aware of is that the TVs also come with software installed to read just about any kind of memory storage device that has a USB connector. Photos on your camera? Plug it in. A movie stored on your thumb drive? Just plug it in. The TV will do the rest, prompting you with a screen to choose the file. Just connect, click and view to your hearts content. You can even hook up an external hard drive. Not all home theater systems were born equal but the basic ones have at least 2 channel speakers, which means you’ll definitely need the analog stereo audio ports, one for the Right and one for the Left. They are typically color-coded red and white. But most home theater system these days will be digital so just locate the digital optical ports on the back, match up the colors and enjoy! Knowing just these 4 basic ports on your new CINEMA 3D Smart TV will open a whole new TV viewing experience. Connect and enjoy! that even as you sit in your living room, you’ll forget where you are. But then you’ll remember and navigate to the Home Dashboard to access tons of premium 2D and 3D content on demand. Hit play, and enjoy amazing 3D with amazing sound, in amazing quality, all on a larger-than-life screen. That’s what we call Ultra Definition. Fastidious replies in return of this question with firm arguments and explaining everything regarding that.